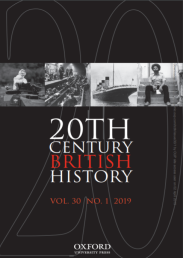 Twentieth Century British History publishes outstanding work on all aspects of the history of Britain and the British world during the long-twentieth century. More than a record of specialized research, the journal places recent British history in conversation with the largest issues animating the historical discipline. For a quarter of a century, Twentieth Century British History has published landmark work by leading scholars in the field, while also providing a key forum for the emergence of new scholars, subjects, methods, and fields. The editors are committed to extending this tradition, publishing the finest work on modern British history from scholars in Britain and around the world. Twice a year, every year, the British government publishes a list of people it has decided to honour. The honours list is probably best known outside of the United Kingdom as the way people get knighthoods, though the list includes various other orders, decorations and medals to recognize various types of service. In exceptional cases, such as royal anniversaries or political resignations, the government produces extra lists to recognize special service. Throughout the twentieth century the purpose and focus of these honours has evolved with changing political and social priorities. British honours represent both a judgment of merit and one about hierarchy. Today civil servants (who have been one of the main beneficiaries of the system) portray it as a politically neutral and organic expression of national worth that rewards good people, and whose most egregiously hierarchical, imperial, and political manifestations are consigned to the distant past. In this narrative, a few past scandals were moments of individual corruption rather than revelations of fundamental problems in the system. The Lavender List was one such moment when civil servants, the press, and politicians portrayed choices about whom the government would honour as a corrupt violation of normal practice. Of all the parties involved the civil service usually exercised the most control over honours lists. One of the few types of honours that escaped this oversight, though, were those on prime ministerial resignation lists. By tradition, these lists offered outgoing prime ministers the opportunity to recognize people who had helped them personally. Advisers, drivers, detectives, and secretaries often filled out these lists. Wilson’s 1976 resignation list looked different. The first draft included multiple appointments to high honours–knighthoods and life peerages–to businessmen who had limited connections to either Wilson or the Labour Party. Most were immigrants who had made it good in the UK. They included notorious financier James Goldsmith, raincoat manufacturer Joseph Kagan, show-business tycoon Lew Grade, and Grade’s brother, EMI executive Bernard Delfont. Wilson seems to have chosen men in whom he was interested or who impressed him in some way. While he did not know Goldsmith well, he was impressed that Goldsmith was suing Private Eye, a magazine Wilson and his wife disliked. This first draft was quickly leaked, sparking controversy months before the list was confirmed. Civil servants, political allies, and, indirectly, political enemies alike put pressure on Wilson to remove or change many of the senior appointments on the list, including Goldsmith, who was removed. Wilson resisted most of the pressure for change. The final list was greeted with derision by politicians and many in the press. Labour politicians objected to the presence of capitalist entrepreneurs with limited or no connections to their party. Conservatives sneered at Wilson’s choice of men who seemed more aligned with capitalist values. Other social conservatives sniffed at their foreign (and often Jewish) origins. Some treasury officials also knew that a couple of the men, including Kagan, were under investigation for financial crimes. Many critics portrayed Falkender as holding power over Wilson beyond her role as his political secretary. Joe Haines, a long-serving member of Wilson’s political staff, coined the name “Lavender List” to support this idea by presenting the list as an intrusion on the corridors of power that was illegitimate because of its femininity. They derided Wilson for his supposed weakness to Falkender’s persuasion. The main official criticism of the list came from the Political Honours Scrutiny Committee, a group of Privy Counselors led by civil servant, chess master, and former code breaker Philip Stuart Milner-Barry. The committee had been set up in the wake of the “sale of honours” scandal of the early 1920s. In effect, though, it laundered the sale of honours by parties by giving them an official stamp of approval. It censured the list precisely because there was no evidence of political donations to Labour on the part of the recipients. To the committee the lack of evidence for money changing hands for honours was proof of the list’s corruption because it was a break with the standard practices of party-sponsored honours sales. Civil servants who were usually secretive about honours lists also leaked news of the undesirable names to the press. Men like Milner-Barry and Wilson staffers Haines and Bernard Donoghue attacked Falkender as unprofessional, but in hindsight their actions and responses look pettier, less discreet, and less professional than Falkender’s. For all that they drew on gendered notions of Falkender’s alleged feminine irrationality they were the ones leaking to the press, playing games, and, above all, furiously gossiping. Wilson was already known for innovative honours. In 1965 his appointment of the four Beatles as MBEs (Members of the British Empire) had caused a minor controversy. He had also engineered an OBE (Officer of the British Empire) for cricketer and anti-apartheid symbol Basil D’Oliviera in 1969. The 1976 resignation list seemed to be a last gesture of defiance by Wilson at the system, and the scandal a last punishment by civil servants and other establishment figures for his attempts at innovation. But the seeming violations of tradition in Wilson’s lists were to become normal in the 1980s and 1990s: popular culture celebrities, “ruthless” entrepreneurs, women Lords, and others from outside the traditional boundaries of the establishment. The political culture that derided Falkender’s influence was in for a surprise. Within three years, a woman would occupy Ten Downing Street not as secretary, but as prime minister. Wilson’s model of honours won out. Most of the controversial names on the Lavender List would look normal today. Featured image credit: “Houses of Parliament” by PublicDomainPictures. Public Domain via Pixabay. Toby Harper is an Assistant Professor of History at Arizona State University. He is currently finishing a book about the history of the British honours system in the twentieth century.